About Us | GaryBeth Jewelry - A Division of Greg Anthony Jewelry Inc.
As mentioned before, when Gregory came to Los Angeles, he was only a child, a young child with a big dream of going to school to become an Aerospace engineer. He started attending school and as he turned 14 and completed junior high school, he started doing something that was new to him: diamond setter in Downtown LA, which in fact he had to catch a bus to get to since he was not old enough to drive. For one reason or another, he felt like specializing in invisible diamond settings as well as channel and pave. The after school job as a diamond setter slowly became a passion and eventually became a passionate dream of creating and having a custom jewelry line. That dream became a reality and is now called GaryBeth (which is the American improvisation of Gregory’s father’s name: Garabed). Per Gregory, that is just a symbol of gratitude to his father for all the hard work as well as dedication to family throughout life. Gregory launched his own business, a jewelry manufacturing, which was established in July of 2007 and named after his two sons: Greg and Anthony. The newest addition to the family, an adorable son named Zachary arrived in spring of 2016. Babikian, a master jeweler himself, was disheartened when he kept hearing about and coming across poor customer service as well as quality taking a back seat at most jewelry related establishments, most of which, manufacture their orders overseas. With that in mind in combination with his utmost passion, he launched a jewelry line that is able to process orders “In house, from A-Z”. That just means that everything and anything order related is done under the same roof, in the same facility, with nothing coming from overseas which puts customers as well as staff at ease and comfort. GregAnthony Jewelry was created with the intent to push the limits of jewelry design in combination with class and sophistication. Same pattern of ideal touch follows all pieces from conception to the finished product in the presentation box. The operation includes numerous designers as well master jewelers who have the passion to create and produce each and every piece “in-house” and more importantly, having in mind that unmatched quality and service sets them apart. Gregory can and will proudly say over and over that all of his creations are 100% made in the US all of which are offered at affordable prices with the greatest customer service. All of our clients are treated and respected just as family members as we appreciate and value each and every one of them. The order process is simple, convenient and comfortable for all. We make sure that every new order is executed with the greatest care to design and manufacturing. Most orders are processed, manufactured and shipped to the clients within 5-7 business days. Throughout the entire process our service staff can continuously be in contact with you (if that’s what you prefer) to keep you updated and notified about your exquisite jewelry piece(s). Your peace of mind is our priority and we always want to make sure you are aware of the process every step of the way. 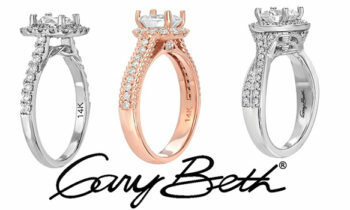 GaryBeth is a division of GregAnthony Jewelry. It is our unique line of engagement, right hand rings as well as wedding bands with a modern twist on all classical jewelry. GaryBeth is pouring love, great energy and positive soul into each and every piece of custom jewelry piece. With the superior craftsmanship and detailed work, many unique rings have been created in rose, yellow and white gold in 14K / 18K / 19K and PLAT. “There is no design without discipline. There is no discipline without intelligence. And lastly, intelligence without Ambition is a bird without wings.” We, at GaryBeth and GregAnthony, believe in the freedom of expression because the outcome always turns out to be as unique as you are.